Preferential Occurrence of Chromosome Breakpoints within Early Replicating Regions in Neuroblastoma. This replication timing data analysis was based on the GLAD algorithm (Hupé et al, 2004) and the VAMP software (La Rosa et al, submitted) developed by the Bioinformatics group from Institut Curie. Neuroblastoma (NB) is a frequent paediatric extra cranial solid tumour whose genetic hallmark is the occurrence of unbalanced translocations. Previous analysis of NB cell lines using chromosomal CGH and 24-colour karyotyping suggested that the majority of the breakpoints corresponding to these unbalanced translocations mapped to early replicating chromosome bands. In order to better evaluate the relationship between the position of the breakpoints corresponding to unbalanced translocations and replication timing in NB cell lines, we have now used genome wide arrays containing 3400 PAC/BAC clones spaced at approximately 1 Mb intervals: (1) to further refine the mapping of breakpoints in 28 NB cell lines by a classical array-CGH method; (2) to assess replication timing of sequences during the S phase of the cell cycle in 7 NB cell lines, using the method recently described by K. Woodfine et al (2004). The BREAKPOINTS folder contains the position of the 142 breakpoints associated to colour transition and gain or loss of genetic material by cCGH that have been further mapped by array-CGH. Breakpoint positions were determined using the DAGLAD algorithm (Hupé et al, manuscript in preparation), a recently modified version of GLAD (Hupé et al, 2004). The CELL-LINES-CGH folder contains the array-CGH profiles for the 28 NB cell lines. The CELL-LINES-RT folder contains the replication timing profiles for the 7 cell lines : for each cell line, 2 profiles were obtained since replication timing was evaluated after a sort of the total S phase or a sort of the first quarter of the S phase (S1). This folder also contains the Average-Total S phase and Average-S1 profiles obtained after calculating an average replicating ratio for the 7 samples, in total S or S1 fractions, respectively. The SANGER-RT folder contains the replication timing profile drawn from the data obtained by K. Woodfine et al (2004) on a human lymphoblastoid cell line of normal karyotype after a total S phase sort. Each folder includes 2 subfolders, “arrays” and “chromosomes” that enable the visualization of the whole genome profiles or the visualization of only a selected chromosome, respectively. Warning: configure your java virtual machine according the following instructions. Your browser must allow java to be used. 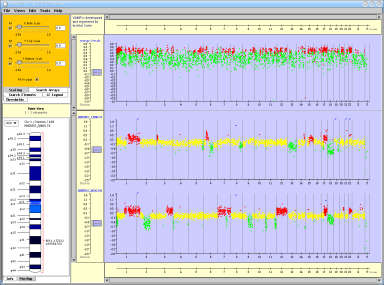 Raw data (gpr files) for the 28 cell line array CGH profiles can de downloaded here.